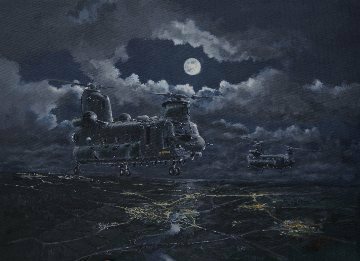 7 Squadron Chinook "EQ" ZA718 in company with another Chinook on Operations over Northern Ireland in 1986. The original of this painting is in the Artist's collection Each print will be signed and dated by the artist the print is printed on semi-gloss medium weight pape,r approx size 20 x 16 inches and is delivered rolled in a cardboard tube. Cost £27:50p including postage in UK (overseas postage cost on request). 10% donated to Association Funds on every purchase. 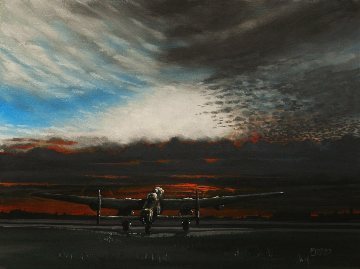 "Lancaster Sunset" depicts a 7 Squadron Lancaster with engines running ready for the signal to taxy from dispersal sometime in 1944 as the setting sun starts to cast dark shadows. The original of this painting was displayed at the 2014 Annual Exhibition of the Guild of Aviation Artists at the Mall Galleries in London. Each print will be signed and dated by the artist the print is printed on semi-gloss medium weight paper, approx size 20 x 16 inches and is delivered rolled in a cardboard tube. Cost £27:50p including postage in UK (overseas postage cost on request). 10% donated to Association Funds on every purchase.